At long last, the Big Lie can be laid to rest: the war in Bosnia did not result in "260,000 dead" or any such nonsense. Even though that figure is mentioned in just about every report mentioning Bosnia, and in recent months has been presented as a result of "most estimates," in truth it has always been a purely fictitious number, created for propaganda purposes in 1994. To the best of my knowledge, this article is not available on the Web in English. I received the translation today from a reliable source, who credited it to Kristian Kahrs. All emphasis is mine. The number of people killed in the war in Bosnia-Herzegovina was around 102,000, according to research done by the International Criminal Tribunalfor the former Yugoslavia (ICTY). This is half of earlier estimates. The most common and most widely used number of killed persons in the Bosnia war has been around 200,000. But research shows that this number is too high. Researchers at the court estimate the correct number to be a bit over 102,000. This number deviates somewhat from a documentation project going on in Bosnia, and project leader Mirsad Tokaca concludes that the number of killed was between 130,000 and 150,000. The research project is conducted by the two population experts Ewa Tabeau and Jacub Bijak, who works for the ICTY prosecution. The results were presented at a conference for population experts, demographists, in Norway one year ago, but they have not been publicly known. NTB has recently gained access to the material presented at the conference, and for the first time they published scientific calculations of how many civilians were killed in the terrible war in Bosnia-Herzegovina from 1992 to 1995. 102,622 civilians and military personnel were killed, Tabeau and Bijak conclude. 55,261 civilians and 47,360 soldiers were killed, including Bosnian Muslims, Bosnian Serbs and Bosnian Croats. The researchers estimate the number of killed civilian Muslims and Croats tobe around 38,000, while the number of killed civilian Serbians was about 16,700. Among military personnel, the researchers think close to 28,000 people were killed in the government army, mostly Bosnian Muslims. On the Serbian side, 14,000 soldiers were killed, while a bit over 6,000 Bosnian Croatian soldiers lost their lives because of actions of war. "The project of the Sarajevo Research and Documentation Center also has a goal to document every single person killed in the war," tells project leader Tokaca. He is not surprised about the numbers of the Hague researchers, but he thinks his own project will conclude with higher numbers. "In October we had over 84,000 documented names of killed persons, and by the end of the year I think we will have around 100,000," he says. The project ends this spring, and Tokaca's rough estimate is that they willend up with a number between 130,000 and 150,000. "I don't like to make premature estimates. But it will be over 100,000, and surely under 200,000. Our list only includes persons killed as an action of war, not those who died of indirect reasons of war," says Tokaca who cannot give enough praise to the support of the Norwegian Ministry of Foreign Affairs. Researchers Tabeau [and] Bijak have taken a clear reservation that the number could be higher than previously concluded. Because the researchers work for the prosecution at the ICTY, the numbers have to be so certain that they can be used as documentation in the court. Numbers for persons dying during the war because of lack of food, low temperatures, lack of medicines and other endeavors in the war inflicted on the civilian population are not included. The researches are also careful to note that new documentation could influence the final result. The most commonly used number for killed persons in the war in Bosnia-Herzegovina has been 200,000, and this number has been repeated ininternational media since 1994. The number originates from Cherif Bassouni, who was the leader of UN's expert commission investigating war crimes in the former Yugoslavia, finishing their work in 1994. Tabeau and Bijak conclude that this number is too high, and it was not based on an examination of the cause of death in every single case, rather a summary statistics based on numbers of killed and missing received by the commission in their work and added together.The researchers also reject other numbers presented, ranging from 25,000 to 329,000. Norway's contribution has been essential to conclude the research. The demographic unit at the office of the prosecution was established in 1998, and the two researchers said their positions would not be possible to fund without generous contributions from Norway's government. Looking at the electoral map of Ukraine, Lew Rockwell ponders whether secession might be one way out of the current crisis. Though I don't know much about Ukraine's history, I know enough to realize the "blue" regions are overwhelmingly Orthodox and Russian, while the "yellow" regions are Catholic (outright or Eastern-rite) and anti-Russian. Indeed, some territories - the Donbas and Crimea, for instance - were Russian lands given to Ukraine by Communists. Where I disagree with Lew, and strongly, is his admiration for Eric Margolis, whose work is colored by a strong Slavophobia. For all his protestations of Imperial invasions in the Middle East, Margolis has been a hard-line warmonger regarding the Balkans. Seems like he's never seen a war on Orthodox Christians he didn't like, just as he's never seen a war on Muslims he didn't oppose. Why not oppose them all, Eric? I've written before about the tremendous benefits of peaceful separation between conflicting communities. If people of Western Ukraine want to become the latest EU snack, who has the right to stop them? If the Russophile Eastern Ukrainians refuse to serve the Brussels-Washington Empire, why should they? By what mystical margin does the will of one group become the only legitimate view? Democracy is obviously nonsense. Unfortunately, secession isn't at issue here. Western Ukrainians are being used as stooges of the Empire, to take over the entire country. The orange-clad, Soros-sponsored followers of Viktor Yushchenko don't want to secede, but rather to force their pro-Russian compatriots to submit to their rule. That's aggression. No libertarian can support that. In today's Guardian, Ian Traynor has an analysis that flat-out admits that the Empire used elections to subvert Serbia, Belarus, Georgia, and now Ukraine. The UK paper may have opposes George W. Bush, but it just loves the postmodern State and the Atlantic Empire. However slimy the Brit government is - I mean, Tony Blair really sets the standard for sleaziness - and however muzzled their press, they still manage to get to the truth more often than their American colleagues, who just march in lockstep. Remarkable. "the campaign is an American creation, a sophisticated and brilliantly conceived exercise in western branding and mass marketing that, in four countries in four years, has been used to try to salvage rigged elections and topple unsavoury regimes." Notice the spin here, implying the elections are always "rigged" and the Empire merely "salvages" them from "unsavouries"! "...the campaign was first used in Europe in Belgrade in 2000 to beat Slobodan Milosevic at the ballot box. Richard Miles, the US ambassador in Belgrade, played a key role. And by last year, as US ambassador in Tbilisi, he repeated the trick in Georgia, coaching Mikhail Saakashvili in how to bring down Eduard Shevardnadze." "The usually fractious oppositions have to be united behind a single candidate if there is to be any chance of unseating the regime. That leader is selected on pragmatic and objective grounds, even if he or she is anti-American. In Serbia, US pollsters Penn, Schoen and Berland Associates discovered that the assassinated pro-western opposition leader, Zoran Djindjic, was reviled at home and had no chance of beating Milosevic fairly in an election. He was persuaded to take a back seat to the anti-western Vojislav Kostunica..."
Reviled is the right word; deplored is another good one. That his death was used as a pretext to impose martial law, create political capital for his party, and put in charge a cabal of far less competent but even more unsavory types, leads me to suspect his own associates offed ol' Zoran. The whole cui bono? thing, you know. But back to Traynor. 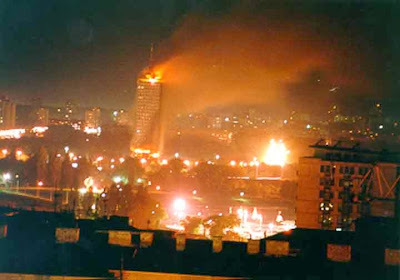 "Officially, the US government spent $41m (£21.7m) organising and funding the year-long operation to get rid of Milosevic from October 1999. In Ukraine, the figure is said to be around $14m." Consider there were "suitcases full of cash" coming into Serbia, in the words of the Washington Post, and you'll realize these figures are much too low. "Freedom House and the Democratic party’s NDI helped fund and organise the 'largest civil regional election monitoring effort' in Ukraine, involving more than 1,000 trained observers. They also organised exit polls. [...] The exit polls are seen as critical because they seize the initiative in the propaganda battle with the regime, invariably appearing first, receiving wide media coverage and putting the onus on the authorities to respond." First Strike propaganda doctrine, so often used in the Balkans wars: any claim, however outrageous, is believable if it comes first. Any denial, no matter how truthful or believable, will be discounted because of perceptions already created by the first strike. Oh, and this also shows that exit polls favoring the pro-Imperial challenger were fabricated, of course. "If the events in Kiev vindicate the US in its strategies for helping other people win elections and take power from anti-democratic regimes, it is certain to try to repeat the exercise elsewhere in the post-Soviet world. The places to watch are Moldova and the authoritarian countries of central Asia." Of course, if the US loses in Kiev, like it did in Minsk in 2001, it will try again. But such a defeat would be a big victory for liberty. In today’s Washington Post, columnist Jackson Diehl cautiously criticizes the US military’s all-out assault on Fallujah, not because it killed people and broke things, but because it made the US look bad on TV. Well, he is an interventionist. Here’s the funny part. Diehl, or any of his colleagues in the mainstream punditocracy, wasn't bothered by Louise Arbour in the least back in 1999, when she was the chief prosecutor of the kangaroo court known as the ICTY. As such, she had issued an indictment against Yugoslav president Slobodan Milosevic in the midst of NATO’s aggression against his country. The indictment came after several very embarrassing “mistakes” by NATO bombers, and made Louise an instant hero in NATOland. For her dedicated service to the Imperial cause, she was later rewarded by a position on Canada’s supreme court, and eventually her present UN post. But I guess the shoe is on the other foot now, and it fits. Every time the candidate favored by Washington and/or Brussels loses an election, it's declared "rigged" or "stolen." Every time they steal an election, it's a glorious "triumph of democracy." I don't know enough to say whether Yushchenko or Yanukovich is the right man to lead Ukraine; that's up to Ukrainians, or at least it should be. But I do know that Yushchenko hired Serbian "revolutionaries" - young janissaries trained by the CIA to create marketing campaigns and orchestrate public demonstrations against incumbent governments in favor of Washington-sponsored challengers. The Independent reported it on November 2. These are the same characters who engineered the "Rose revolution" in Georgia (Caucasus) last December. There is a clear pattern here, from Serbia in 2000, Belarus in 2001 (that one failed) to Georgia in 2003; now the people behind the supposedly idealistic "Serbian" activists (they actually loathe Serbs and their culture, and worship Modernity and the omnipotent welfate State) are trying to have their way with Ukraine. Lord forbid Ukrainians elect who they want, and not a "progressive reformer" or some such character, endorsed by the Empire. The motto is taken from Ovid, and means: "The result justifies the deed." Or, in the more familiar iteration: "The end justifies the means." If ever there was a slogan that would adequately describe the Imperial government, this is one. American imperialism is bad for America. It undermines our republican (small-'r') institutions, it renders the effort to roll back Big Government futile, and it corrupts our character as a people. It also kills those it is supposed to be "liberating" – a moral conundrum that none of the advocates of America's "benevolent hegemony" acknowledge, let alone have an answer to. War has a degenerative effect on republican institutions, and fatally undermines the rule of law and constitutional government, for the simple reason that war is lawlessness. While we all pretend that there are "rules of war," and every nation swears to abide by the Geneva Conventions, everybody knows that this is balderdash pure and simple. If you want to see the "rules of war" in operation, take a look at that video of a U.S. Marine blasting the head off a wounded insurgent in a Fallujah mosque. That is the true face of war, which is why no American television station has dared show the full unedited footage. War centralizes political authority and economic power, investing all power in the state – and assigning obedience, rather than freedom, to the top rank in the social hierarchy of values. This, for libertarians, is the crux of the matter. All States are necessarily aggressive, first and foremost against their own citizen-subjects. They exist by plundering producers and redistributing the loot to their precinct captains and supporters. The State is perpetually at war with those it robs and regulates. An apparatus especially designed to maintain a monopoly of violence in a given geographical area, it is the perfect war-fighting machine. Aside from the question of whether such an institution is a necessary evil, or should be altogether abolished, all libertarians must agree that the power of the State should be severely limited – and not only within its own borders but also beyond. The quest for empire is, in itself, a form of corruption: it is the rot that eats away at the tree of liberty, invisibly hollowing it out and depriving it of its essence. Let us tend our own garden, and leave others in peace to tend theirs. It was about time I got on this whole blogging bandwagon, I guess. For the 18 months, I've been posting on the Antiwar.com blog - and I intend to continue doing so, mind you - in addition to my regular weekly column there. Not only is it a great way to post up-to-date comments on developing stories, but it's also fun. So I figured, might as well expand the offering, and blog some more about news and commentary from and about the Balkans - specifically, the former Yugoslavia - that doesn't necessarily deal with opposition to Imperial warfare. I don't think I've seen a blog anywhere about taxation in Bosnia, or ethnic relations in Croatia, or the occupation of Kosovo, or the slow death of Macedonia; and that's a shame, because these are interesting topics. To me, anyway. I took the title for the blog from the book by Dame Rebecca West, published between the world wars. It's no easy reading, but considering the subject, it cannot be. What this blog aims to be is a voice in the wilderness against the post-modernist nihilism, statism and tyranny that - in addition to outside intervention - plagues my former homeland. Thanks to a century of "progress," the kind, noble people Dame Rebecca described have all but vanished. If by anything I do I can bring some of them back, I promise to try.